MacGregor, Robert J.- Age 95, of Flint, died Wednesday December 5, 2018. Funeral services will be held 1PM Friday December 7, 2018 at Sharp Funeral Homes, Miller Road Chapel, our Temporary location at Hill Creek Church, 5363 Hill Road., Swartz Creek (Mundy Township). Visitation will be held 11AM until time of service Friday at Hill Creek Church. Those desiring may make contributions to the American Heart Association. 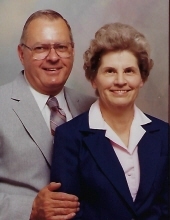 Robert was born in Flint, on August 18, 1923 the son of the late Clarence Clide and Vesta Ethelyn (Bostwick) MacGregor. He married Pauline Case on December 26,1946 in Ohio and she preceded him in death on March 11, 2006. Mr. MacGregor proudly served his country in the U.S. Army during WWII. Robert Joined the Army in 1942 and was part of the 186 Depot Ordinance, he was stationed in England on his 19th birthday, spent his 20th birthday in France and spent in 21st birthday in Germany. He was honorably discharged on December 3, 1945. Robert owned and operated R.J. MacGregor retiring in 1996. Surviving are: daughter, Kerry MacGregor of Flint; sons, Dale MacGregor of Lapeer, Lynn MacGregor of FL and grand daughter Danielle MacGregor; favorite grand dog, Mojo. He was also preceded in death by brothers, Richard, Don and Bruce. Tributes may be posted at www.sharpfuneralhomes.com. To send flowers or a remembrance gift to the family of Robert J. MacGregor, please visit our Tribute Store. "Email Address" would like to share the life celebration of Robert J. MacGregor. Click on the "link" to go to share a favorite memory or leave a condolence message for the family.